Hey Gregg! 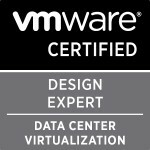 Don’t use the term accreditation when referring to the VCDX. It’s a certification and there is a big difference but unfortunately they are used interchangeably. The VMware Sales Professional (VSP) or VMware Technical Sales Professional (VTSP) are accreditation.